I might be on holidays but I’m excited to pop by and announce our NEW ALL INCLUDED book bundles. That’s all our books available in the one package – for a limited time only. For the first 30 people who purchase the hardcopy version – you will receive a SIGNED copy! Your hard copy of Well & Good PLUS a copy of Cleanse Yourself (e-book) AND Debunking PCOS (e-book) all for just $48 SAVE $28.95! (yup, I’ve lost my mind!) That literally means you’re getting the e-books for FREE. Your e-versions of Well & Good, Cleanse Yourself and Debunking PCOS for $29! That’s a saving of $19!! These bundles are available for a short time only. 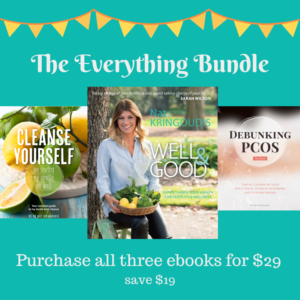 I’m excited to give you access to all our e-books for a special price making it more accessible for you to help you get clued up on your health and supercharge your wellbeing.